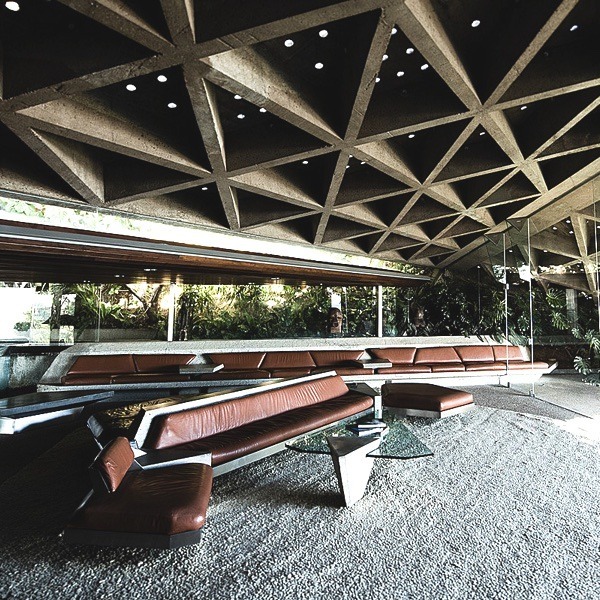 The sprawling in-situ concrete geometric play of a structure that is the Sheats-Goldstein Residence remains a striking example of Lautner’s whimsical fusion of modernist Organic Architecture and space-age ideals. Profoundly influenced by his mentorship under Frank Lloyd Wright, this Residence – originally designed for a doctor and artist couple with five kids – allowed its architect to design each element: fittings, fixtures, furniture and all. Retractable skylights, automated panels and concealed faucets were key aspects to the ‘grammar’ (a famously Wrightian term) of the form which simultaneously appears monolithic and dynamic – bare and all-inclusive. Under constant renovation since its completion in 1963 the Residence is now home to a James Turrell light installation entitled ‘Above Horizon’ and has been absorbed into the popular architectural canon with the assistance of presence in films such as the The Big Lebowski (1998).